Fun & Free Printable Baby Shower Games - Ready to print and play! Ready for you to print and play! These free printable baby shower games can really make planning AND hosting a baby shower much easier. You have here a delightful & unique selection of free printable baby shower games, ready and waiting to help you host the perfect baby shower. These are easy to print and fun to play! Here are the all new Baby Shower Bingo cards , and they are ready for you to print and play! How to play: Print off the cards above (there is an easy .pdf version you can print off) and cut them out. Print off one extra game card for your master copy. With scissors, cut up your master copy into the individual squares - each square with one word on it. Put these squares into a hat (or diaper bag) and draw them out one at a time during the game. Read the word on your square when you pull it out. Give your guests time to find the word on their card and place a game piece over the word. Then you draw out another square and read that word aloud, as before. This continues until someone fills in a row (vertically, horizontally or diagonally) and yells "BINGO!". Or you could use these free printable baby shower game cards to play Gift Bingo: Instruct the guests that as the expectant mother is opening her gifts, they place a Hershey's Kiss or other game piece on their card if the gift is on one of the squares of their Baby Shower Bingo card. So, for example, if the mom has just opened up a package of onesies, then everyone would look on their card for "onesie" and mark that square with a game piece. Someone wins if they get 5 in a row, 5 in a column, or 5 in a diagonal. Keep playing even if someone wins in the middle of opening gifts; keep playing until all the gifts are opened. How well do you know your Old Wives' Tales? When an expectant mother's nose is widening during pregnancy, is she having a girl or boy? Find out with this clever and fun trivia game. Print out these Old Wives Tales Trivia game cards . Give each guest one of these game cards with a pen. Let everyone answer the trivia questions the best they can and then at the end, you read the correct answers. The guest who answers the most questions correctly wins! This is a fun baby shower game that will really bring out the creativity in everyone! Print out these blurbs for baby shower game cards . You will also find the game instructions and an example of how to play the game. Have Fun!! Preparation for this free baby shower game: Print out a copy of this free Around the World baby shower game card , one copy for each guest. How to play this free printable baby shower game: Give a copy of the game card to each guest. They must match each of the 10 languages to the corresponding word for "baby". The guest who matches them CORRECTLY first wins! Or you could give everyone a time limit and then at the end, read the answers and every guest who guessed correctly wins a prize! Print out a copy of the answer key to check the winner's answers. Baby Shower Price is Right! Preparation for this free baby shower game: Before the Shower, go to the store and purchase 10 - 12 small baby items. Be sure to keep the receipt, so you know how much each baby item costs. Any baby items that match your specific theme would be excellent items to have! Then, make a list of the baby items on one side and a blank line on the other. Click here for a free printable baby shower games card. How to play this free printable baby shower game: During the shower, give each guest a list and a pen. Show each item to the group and have them write down what they think it costs. Then have them add up their prices for all the items. The one closest to the actual total on your receipt (minus the tax) is the winner! Present the expectant mother with the baby items. She'll be needing them! Preparation for this free printable baby shower game: Print out this list of A through Z letters, print one copy for each guest. How to play this free printable baby shower game: You can either do this individually or in teams of 2 or 3 people. Give each person (or team) a piece of paper and a pen. Have them fill in each space with a baby related item or term (or pregnancy related term) that starts with that letter. Give everyone 6 - 8 minutes to fill in the list. Whoever fills in the list most completely wins! Q, X, and Z can be tricky. Tell the guests to be creative. Click here for a possible list of items . Preparation for this free printable baby shower game: Create a list of 15 - 20 adult animals and their corresponding baby names. For example: Bear - Cub. Click here for an animal baby shower game example list that you could use. Print a list off for each guest. Also, print off an answer Key for yourself so you can read the correct answers at the end. Here is the answer key for the example list. How to play this free printable baby shower game: Give each guest a list of animals and give them 4 - 5 minutes to fill in the blanks with the appropriate baby animal names. Read the correct answers from the Key and whoever gets the most correct is the Designated Veterinarian and the winner! Preparation for this free printable baby shower game: Make a list of 15 - 20 words of baby related items. Then scramble up the letters of each word. Make copies of the list for each guest. Click here for a free printable baby shower game card. How to play this free printable baby shower game: Give each guest a copy of the list and a pen or pencil. They must unscramble all of the words. Give them 5 - 6 minutes to unscramble the words, or play until someone unscrambles all of the words. The first one to unscramble all of the words or unscramble the most words in the allotted time is the winner! This game is played just like "Baby Babble" above, but instead of baby related items, use baby names that are scrambled up. Click here for a free printable word scramble baby shower game card. Preparation for this free printable baby shower game: Before the shower, make a list of the mother-to-be's idea of the perfect baby in terms of physical characteristics and personality traits, and have the expectant mother fill it out. Click here for a free printable "Perfect Baby" game card that you could use. Make a copy of the game card for each guest. How to play this free printable baby shower game: During the shower, give each guest a copy of the list of the ideal baby characteristics and a pen. Have each guest fill out the paper, trying to guess what the mother would prefer. The guest with the closest guesses to the mommy-to-be's list is the one who thinks the most like she does, and therefore wins the game! No holding back for this Baby Shower Game. There is something about Bingo that people just THRIVE on! It has got to be the grandmother of all baby shower games. Preparation for Gift Baby Shower Bingo: Before the Baby Shower, print off these free baby shower bingo cards ... They have names of typical baby shower gifts. There are 20 different cards to print off, each one is a different order (so that each guest gets a differently ordered card - otherwise everyone would win at the same time!) Print off a different Bingo card for each guest. Buy Hershey's Kisses or little plastic babies at a craft store for the game pieces (or M&M's, Hershey's minis, or other candy). You will need about 15-20 game pieces for each guest. How to play Gift Baby Shower Bingo: During the Baby Shower, Hand each guest a bingo cards and 15-20 game pieces. Instruct the guests that as the expectant mother is opening her gifts, they place a Hershey's Kiss or other game piece on their card if the gift is on one of the squares of their Baby Shower Bingo card. Someone wins if they get 5 in a row, 5 in a column, or 5 in a diagonal. Keep playing even if someone wins in the middle of opening gifts; keep playing until all the gifts are opened. (Have multiple prizes because there will likely be more than 1 winner). This is a lot of fun because it goes along perfectly with your Baby Shower Theme! 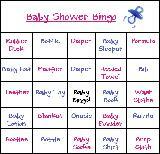 Once you have found your theme, click on it and print off the Themed Baby Shower Bingo cards. There are 20 different cards to print off, each one is a different order (so that each guest gets a differently ordered card - otherwise everyone would win at the same time!) Print off a different Bingo card for each guest. Buy Hershey's Kisses or little plastic babies at a craft store for the game pieces (or M&M's, Hershey's minis, or other candy). You will need about 15-20 game pieces for each guest. Also, print off one extra card and cut out each of the squares. You will put these squares into a hat so you can draw them out and read them during the game. How to play Themed Baby Shower Bingo: During the Baby Shower, Hand each guest a bingo cards and 15-20 game pieces. You, or the Mother-to-be will draw a square from a hat (or a diaper bag:) and read the word. Instruct the guests to then look on their card to see if the word is found on their card. If it is, then they put a game piece on that square. Keep playing until all of the squares are drawn out and read. Someone wins if they get 5 in a row, 5 in a column, or 5 in a diagonal. Usually there are more than one winner so have multiple prizes just in case! Fill in your own words on blank Baby Shower Bingo cards. Preparation for 'Make your Own' Baby Shower Bingo: Before the Baby Shower, print off these baby shower game bingo cards Print one blank card for each guest. You could choose different baby items (and use these instead of the Baby Shower Gift Bingo cards above). Or instead of doing Baby Shower Bingo during gifts, you could play it anytime during the shower, 'cause everyone is in the mood for a game of Bingo ANYTIME! You could fill the boxes with the names of the guests, baby actions (gurgle, crawl, burp the baby, change the diaper), flavors of baby food, different baby names, or any number of other baby related themes. You can fill in the boxes on all the cards (in a different order each time) yourself, or better yet, pass the cards out during the shower and have each guest fill out her (or his) own. If you are going to have the guests fill in their own boxes (wise decision! ), then make a master list of the items, or guests' names, or baby actions or whatever you wanted to play Bingo with. Make an extra copy of this master list and cut out each item separately into strips of paper. These you will put in a hat (or diaper bag:) to draw out of during the game. Buy Hershey's Kisses or little plastic babies at a craft store for the game pieces (or M&M's, Hershey's minis, or other candy). You will need about 15-20 game pieces for each guest. How to play 'Make your Own' Baby Shower Bingo: During the Baby Shower, Take your master list of items, (or actions, names, or whatever) and read the list to all of your guests. Instruct the guests to fill in their Bingo card with each item that you read in any square of their choosing on their card. If you don't have 24 items (or names, or baby actions, or whatever) then tell the guests to use some words twice. Now for the Fun Part! Then, from your hat (or bassinet, or diaper bag) have the mother-to-be or yourself draw one slip of paper at a time and read the word out loud. Instruct the guests to then look on their card to see if the word is found on their card. If it is, then they put a game piece on that square. Keep playing until all of the squares are drawn out and read. Someone wins if they get 5 in a row, 5 in a column, or 5 in a diagonal. Usually there are more than one winner so have multiple prizes just in case! Preparation for this free printable baby shower game: Before the shower, make a list of 10-15 different lines from various nursery rhymes. It is best if they are not the most recognized line from the rhyme. Use this free printable Nursery Rhyme game card if you would like. Make a copy for each guest. How to play this free printable baby shower game: During the shower, hand each guest a pen and a copy of the list. They must write down the name of the nursery rhyme for each line on the list. The guest who gets the most correct is the Nursery Rhyme Champion! Mother's Baby BlossomThis is a sweet and fun baby shower activity that is meaningful for the expectant mother. Preparation for this free printable baby shower game: Before the shower, print off a copy of this printable Mother's Baby Blossom game card for each of your guests. How to play this free printable baby shower game: Give each guest a copy of the Mother's Baby Blossom card and a pen or pencil. Have them write down a memory they have of something that their mother did for them when they were young that helped their life blossom. Have everyone read theirs when everyone is finished and then collect the cards and give them to the expectant mother to always remember.